Georgia doesn’t need to buy additional volumes of natural gas from the Russian energy company ‘Gazprom’ anymore, Minister Kakha Kaladze said. He said that the Azerbaijani state company SOCAR solved the problem of natural gas supply. 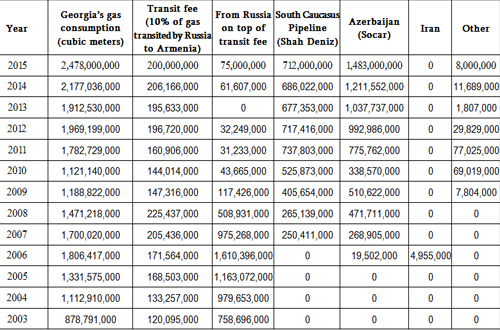 Georgia will receive additional 463 million cubic meters of gas from Azerbaijan. The corresponding agreement was formalized March 4 between Georgia and the SOCAR. The document was signed by Georgian Energy Minister Kakha Kaladze and SOCAR President Rovnag Abdullayev. We have signed an agreement, which will secure stable gas supplies to Georgia,” head of SOCAR, Rovnag Abdullayev, said at a joint news conference with the Georgian Energy Minister Kakha Kaladze. Kaladze said that because of significantly increased gas consumption in Georgia over the past several years, the country had been seeking for additional supplies. Georgia’s annual gas consumption more than doubled since 2010 to 2.47 billion cubic meters in 2015, a 13.8% increase compared to 2014. Georgia receives gas from two sources in Azerbaijan. About 712 million cubic meters of Azerbaijani gas came in 2015 as part of the deal in frames of the BP-operated South Caucasus Pipeline from Shah Deniz field. 1.48 billion cubic meters were imported in 2015 as part of a separate contract with SOCAR. Kaladze said that “there were technical problems with import of additional gas volumes” from Azerbaijan, “but thanks to SOCAR’s tireless efforts it was made possible” to solve it and the additional gas will be supplied to Georgia via Shah Deniz pipeline. “The agreement implies that we are still under the terms of the previous contract, and Georgia will receive 10 percent of the natural gas transit,” Kaladze told reporters. The latest deal was reached after months of regular negotiations following the expiration of a previous Gazprom-Georgia agreement on December 31, 2015. The minister expressed hope that the new deal, in force until the end of 2016, would yield to monetary compensation at next stages of negotiation, a position that Tbilisi had lobbied for in lieu of a transit fee.